FOR IMMEDIATE RELEASE: Portland, Maine (September 10, 2018) – New England Fights (NEF) will hold its final mixed-martial-arts event of 2018, “NEF 36: Battle for the Gold,” on Saturday, November 17 at Aura in Portland, Maine. Earlier today, the fight promotion announced the first fight scheduled for the event. Catie Denning (1-0) will take on Taylor Thompson (2-0) in an amateur women’s bantamweight contest. 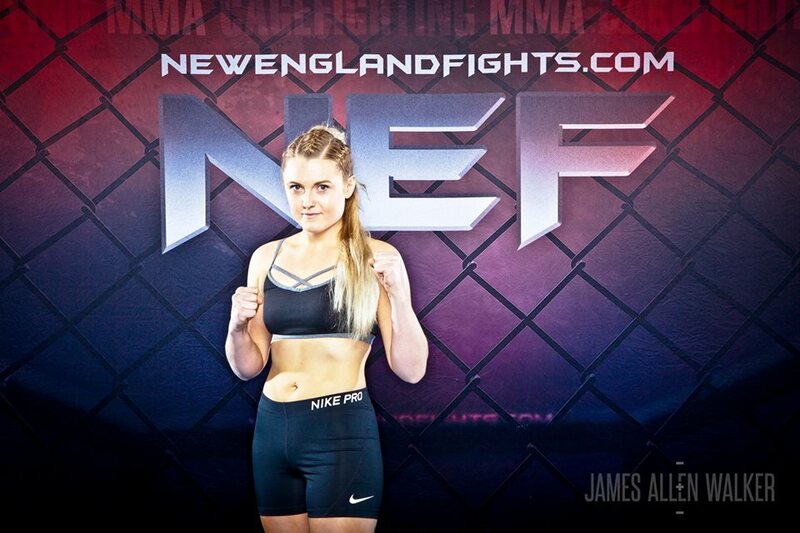 Catie Denning made her amateur MMA debut last February at “NEF 32” in Lewiston, Maine. She dominated Chelsea Tucker (0-3) for three rounds on her way to a unanimous decision victory on the judges’ scorecards. Denning is a member of Young’s MMA based in Bangor, Maine where she will once again train for her sophomore cage bout. Denning’s opponent, Taylor Thompson, will be making her NEF debut on November 17, but she is no stranger to the New England MMA scene. Thompson is undefeated with two fights under her belt in Massachusetts. Both wins came by way of stoppage, including a first-round submission of Tiffany McCoy (2-2) last January. Thompson trains with BST MMA & Fitness based in Mendon, Massachusetts. NEF’s next mixed-martial-arts event, “NEF 36: Battle for the Gold,” will see the company make its return to Aura in Portland, Maine. The event is scheduled to take place Saturday, November 17, 2018 with a bell time of 7 pm. The ticket pre-sale is happening now at www.AuraMaine.com with promo code “NEF.” Tickets will be on-sale to the general public on Monday, September 10 at 9:00 a.m. EDT.